Throughput Rate: 15 to 20 / min approx. It is pedestrian barrier installed in conjunction with any access control system provides valuable assistance to security personnel at any monitored entrance. This is available as a single- or multiple-lane setup.Flap Barrier are compatible with most access control systems, such as magnetic, biometric and proximity readers. - Rapid identification technique are available to identify accurately and Efficiently the magnetic card, barcode card etc. - Personalization for all type of ticket readers or contact less antenna. - With direction indication, guiding passenger to entry and exit. Retractable Flap barrier is available in single lane & multiple lane configurations as per site requirements. Two housings with retractable flap make one lane of access. One housing with two flaps back to back is used in between the end columns to increase the number of lanes. We are dealing in flap barrier that are made for security purpose. These barriers are used in many places like parks, metro stations, etc. These motorized gate are made by stainless steel. These barriers are widely used for safety and preventive measures. 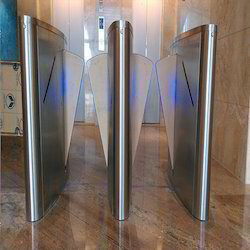 The PE- Flap Barrier Turnstile is a Cutting Edge solution that provides a combination of reliable mechanical as well as electronic restriction for unauthorized Entrants. A Time and Attendance Reader can be integrated for Employee attendance programs. 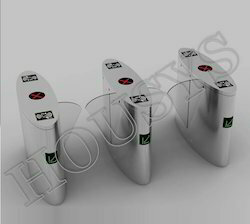 We are dealing with Flap Barrier that are made for security purpose. These barriers are used in many places like parks, metro stations etc. These Motorized gates are made from stainless steel. These barriers are widely used for safety and prevention measures.